Spirulina what use There are 4 products. The spiruline, an asset for the growth ! Spirulina for the growth of children and adolescents : the rare essential fatty acids. 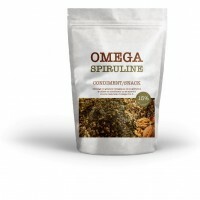 The spiruline has a very high content in acid linolenic gamma (AGL, precursory fatty acid of mediators occurring in the anti-inflammatory and immunizing processes), what makes of her the second source of this nutriment after the maternal milk. The virtues of Spirulina to optimize endurance capabilities have been known for centuries. The many active ingredients it contains optimize physiological and perfectly natural way the sporting abilities, practicing recreational sport where top athlete. The regular practice of the sport requires a food rich in vitamins, minerals and trace elements. Rather than to take a multitude of food, often industrial complements, why not integrate the spiruline into its daily food ? This microscopic seaweed is indeed the ideal food complement to the sportsman, to by it's of exceptional nutritional values. Spirulina functional food of the highest order whose properties are largely consistent with the needs of seniors.